Visitors to Washington's Olympic National Park and National Forest report unnerving experiences with wildlife in the last few days. On June 14, a hiker named Jim Decker got an unexpected taste of nature when he ran across a mountain goat with a pugnacious attitude. Decker and his wife were enjoying a hike on the Mount Rose Trail near Lake Cushman. Somehow the couple became separated, but Decker soon had company. A mountain goat with a nasty attitude soon began to pursue Decker down the trail chasing him nearly a mile. At a clearing Decker dropped his pack and drew a knife, expecting the worst. However, a group of approaching hikers apparently tipped the balance in the goat's mind, and it left. Three days later, nort hwest across the peninsula, rangers began receiving reports about a steamed up cow elk at the Olympic National Park's Hoh Campground. On that Friday, the elk demolished a tent in the campground, and subsequently charged a ranger's patrol car. Over the weekend rangers carefully watched the cow, "hazing" her when she came too near campers by sounding off loud noises. The wait-and-see attitude of the rangers reached a head, when on Monday the elk charged two more vehicles. Park officials felt they had no choice at that point, and shot the elk, sending samples of her brain to a lab for analysis. 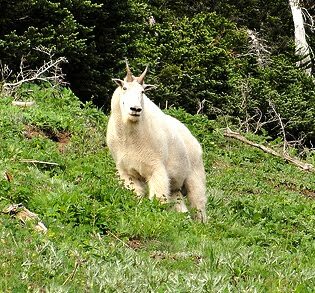 Last fall, another Olympic National Park visitor was killed when gored by an aggressive mountain goat. That animal too, was destroyed. Park officials say many of the Roosevelt elk in the park are getting "habituated" that is, getting accustomed to humans--often by taking handouts. They repeatedly warn visitors to not approach wildlife closely, as elk are known to charge. In the case of the not-so-charming mountain goats, officials have posted signs warning hikers of potential run-ins. Like many of the park systems around the nation, Washington State is struggling with economics. With fewer and fewer dollars being handed out by the legislature, parks are struggling to 'make it' with locally generated revenue: Read that park fees. 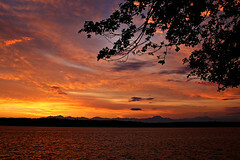 One of the revenue jewels of the Washington State Parks' system is 109-acre Kopachuck, a boat-in and drive-in camping park. In these days of budget (and throat) cutting, Kopachuck is a revenue producing park--the money gleaned from campground fees actually offsets operational costs. But trouble has appeared in this paradise, not in the form of a serpent, but rather a fungus called Phellinus weirii. Phellinus infesting conifirs can produce a serious illness called laminated root rot. After trees fell in another Washington state park, officials set out on a health-care check of all other parks. Tree biologists found laminated root rot in the huge fir trees surrounding Kopachuck's campground. It's a kind of insidious thing: The big trees look just fine, until one day, they simply keel over and crash into the ground, taking picnic baskets, tents, and unfortunate bystanders with them. Left to themselves, the big fir trees have a cure for the problem: Once the tree dies, the root rot dies along with it. The trouble is, it can take a long time for the trees to finally fall over and "take out" the fungus with them. Meantime, the state worries about the potential liability issues. An alternative solution is to cut down the infected trees and sell them off as timber before the root fungus kills the tree. Not everyone likes the idea, even though there would be a short-term gain from the sale of the timber. But here's another bug in paradise: Kopachuck is also home to bark beetles, which find dead wood a great meal. But if you stress the forest by cutting down diseased trees, the bark beetle population will explode, and they may start taking to healthy, living trees. It's a damned-if-you, damned-if-don't proposition. So far the state agency that oversees the park hasn't decided what to do. To protect visitors they have closed the campground, leaving the beach and day-use area open. Some worry this could leave Kopachuck vulnerable to the next legislative session's round of budget cutting axe wielders. Without the revenue producing side of the park up and running, the park will fall into the realm of a budget-sucker, ripe for closing up. photos: Kopachuck beach scene, kfkirsch on flickr.com; laminated root rot, B.C. Ministry of Forests and Range. Mount Rainier National Park Superintendent Dave Uberuaga has announced the launching of the parks official Twitter page. Follow the park at http://twitter.com/#!/MountRainierNPS to discover news as it's happening, learn more about park topics that are important to you and get the inside scoop in real time. Before you leave home, or during a stop while en route to the park, check the park out on Twitter. Is the parking lot full at Paradise? Are the roads open throughout the park? Are there any emergency situations that will affect your visit? Keep up-to-date on road and facility openings and closures, emergency situations, special events, and watch for other noteworthy and timely tweets. Future plans for park social media include Facebook, Flickr and YouTube pages. The best place to learn about the launching of these sites is on the Official Mount Rainier National Park Twitter page! 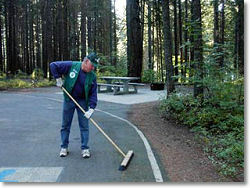 Volunteers play a vital role in sustaining Washington State Parks, providing more than 300,000 hours of service each year. Opportunities are available across the state for a variety of short- and long-term projects. Volunteers serve as camp hosts, assist in visitor centers and answer questions from the public; maintain and restore trails; give museum tours and interpret history; and provide routine maintenance such as mowing lawns. 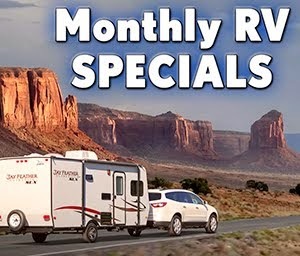 The Camp Host program is of particular interest to many RVers. The positions offerenthusiastic and interested volunteers the chance to stay and have fun in beautiful and diverse park settings while gaining experience in park operations and visitor services. Hosts are needed year round in most Washington state parks. They greet campers, answer questions and perform light maintenance particular to the park. This may include litter pick up, raking campsites or lawn mowing. Hosts may assist with other projects around the park based on the parks needs and the hosts’ skills and interests. Hosts receive free camping and hookups in exchange for performing these duties. A typical host assignment is 30 days. This may be extended up to 90 days at the park manager’s discretion. Hosts must provide their own RV and equipment. Hosts should enjoy working with the public, have the desire to accept new challenges and possess the willingness to learn about Washington state parks. Learn more at the Washington State Park website.